Any photographer who gets a call to go and shoot with FC Barça is going to have an initial reaction of ‘yes!’ I reckon, even if they are FC Madrid fans. …and a shoot like this, which was a contractual obligation, for the sponsors Beko usually means they want to do the minimum possible. So my friend Brett and I, who came to help out, were running from pillar to post trying to get all the shots we needed. I had a dream for dramatically lit portraits but that plan did not see daylight: we were in essence more like tolerated paparazzi than official photographers! 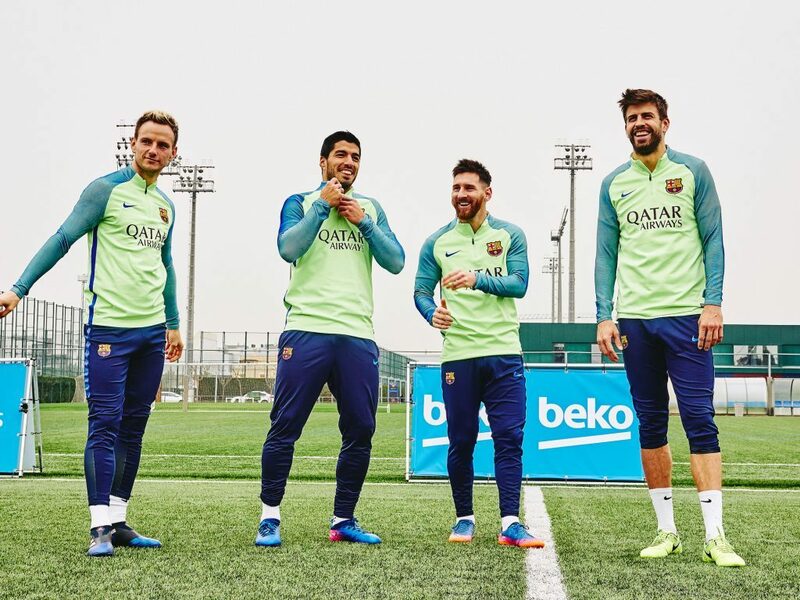 The Barça players themselves were not so bad, they just used the time to horse around and have a laugh. It was the officials of the club who kept clock-watching and throwing the crew curve balls about what was happening and when. Many years ago when I was assisting a photographer called Martin Black we did quite a few jobs on film sets, there to capture publicity shots for the production. I could never understand the attitude of the crews back then, they would begrudgingly give us precious little time to set up for our shots (medium format cameras need powerful and considered flash lighting) and we would often be waiting around for ages, twiddling our thumbs while all the technical stuff for filming was being finessed. The truth is there was always plenty of time to do what we needed and in the end, we were there to take shots that basically promoted their films! This job was in sharp contrast to one I did for a magazine a few years ago about Espanyol. We got access to everything and all the time in the world to get the images you wanted.